As a gunner, you can easily tank and deal sufficient AOE damage. It has a long range, with a long cool down period for skills. 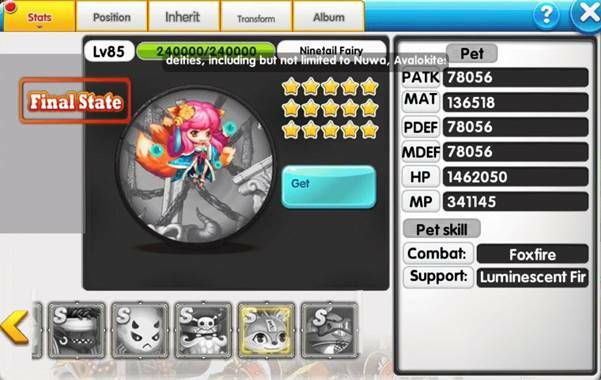 For skills, Nano Booster is a must since it is the most important buff skill for Gunner and it will be unlocked at level 30. Before level 30, rotating use between Shark Rocket and Robotic Arms, along with Orbit Crisis and Funnel Cannon. Before level 65 and after level 30, Orbit Crisis, Funnel Cannon and Nano Booster would do just fine. Once level 65 is reached, you can use Titan Ship (unlock at level 45), Destructive Laser and Nano Booster. Note that the position of skills are flexible and you can always try a different combination for a better outcome. 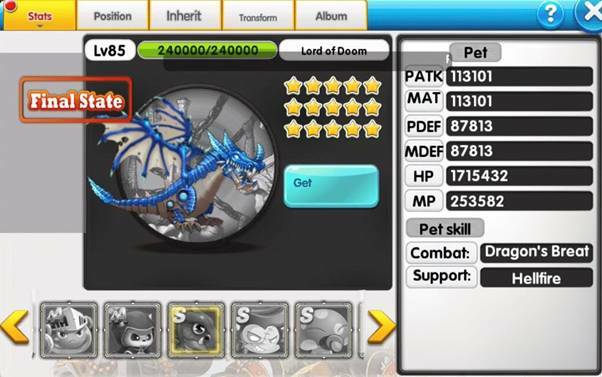 For pets, if you are free to play players, I would recommend Mech Dragon, Iron Mushroom and Pirate. To position them, Mech dragon is better to be positioned as the combat, Iron Mushroom is to be positioned in the guard 1 slot, and Pirate is to be positioned in guard 2 slot. The position is not fixed for combat because some player might also want to use Immortal Ginseng as their combat for the HP buff. So just give a try around those pets to find the best one that suits you. The reason why I recommend Mushroom and Pirate to be positioned at 2nd and 3rd slot respectively are according to their pet stats. Among the free to play players, mushroom has the highest magic attack and pirate has the highest pdef and mdef stats, which suits best for these players. 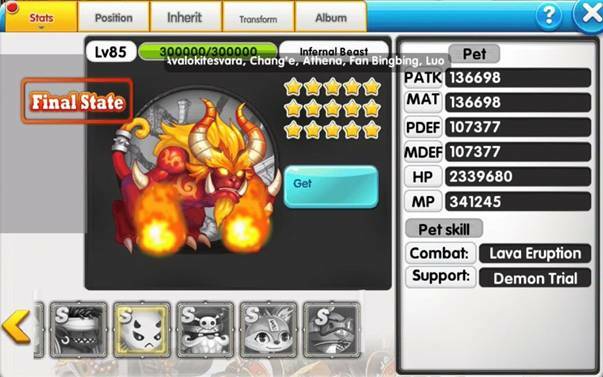 However, if you are a pay to play player, I would recommend you to use Flame Beast as combat, Immortal Fox or Penguin (preferred) as guard 1 slot and Pirate as the guard 2 slots. Alternatively, you can choose to use cupid or kirin as the guard 2 slots when you are doing team dungeons or demonic realms or world boss. Cupid and Kirin have 80% damage and 100% damage boost respectively for the players and their team members. 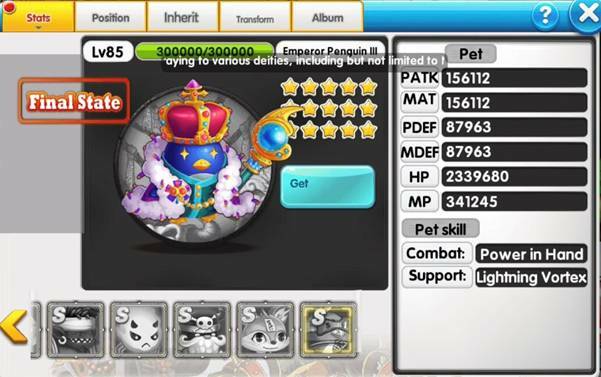 Penguin is the new pet that has recently been released, it is a great pet with slightly higher physical/magical attack and slightly lower pdef and mdef as compared to flame beast. It has a greater effect when it is positioned in guard 1 due to a larger addition of Matk and Patk stats, relative to all other pets. Note that Cupid, Kirin, Penguin and Immortal Fox can only be obtained from events. 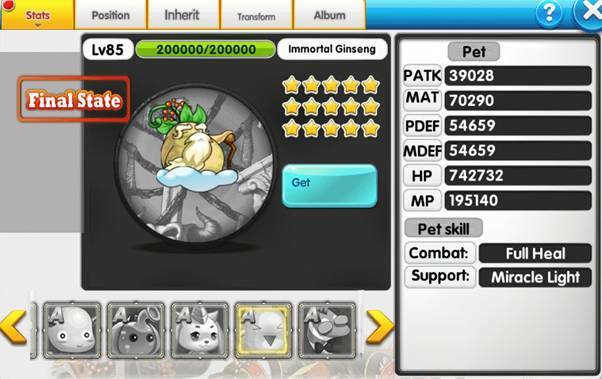 Immortal fox cannot be inherited or inherit to other pets, while the other 3 pets can. The rest of pets mentioned above including Flame Beast can be obtained from redemption by using altar points. For Gems, I would recommend that the focus should be put on Matk, Crit and HP. Gunners have a Hit buff which is really useful so their characters would realistically need fewer Hit gems than others. However Hit gems may still be necessary if the character’s average hit is lower than an Archer’s evade when both are buffed (assuming the same level, equips etc). After which, get 5 Pdef and mdef gems each for their respective slots as they are crucial to ensure the gunner survives. With the remaining slots, play around with evade or crit def whichever you prefer. Note that maximum slots one can have are 40 slots after getting level 60 equip. If you have enough points (8000) for astrology or decided to spend some diamonds for those best stars available during the event each week, I would strongly recommend you to get the red stars which would usually include 2 stats into one star. For the red stars, Star Wisdom (matk, matk%) and Star Freedom (Hit, evade) are the priority 80k diamonds redeemable star. Whilst Star immortality (hp, hp%), Star Grace (damage%, def% and can be bought from VIP16 pack) and Star Chaos (crit, crit damage%) are redeemable priority for astrology at 8000 points. For refine, it is essential for 2x Matk and 2x HP to be slotted into each of your equipment. 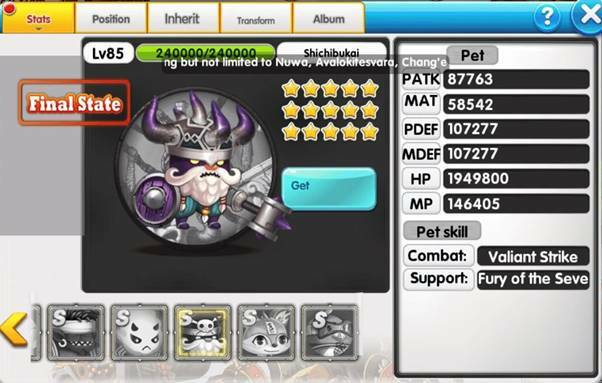 This is according to Gunner’s matks property and its HP recovery buff. In addition, it is good to have Crit, Hit (if still lower than an average archer's evade after both parties are buffed), Pdef/Mdef, Crit def into your refine. In addition, for pay to play players, I would strongly recommend crafting your equipment to orange quality which is the best quality so far in starlight legend. They are definitely worth to spend diamonds on because they give you a much better stats and higher force. Always start with crafting your weapon (Gun) as a priority.